How and where will you spend that prized weekend R&amp;R? Leave it to us! Unfortunately, it still isn't that APEC Summit long weekend. Check out our well-thought-out weekend guide below! 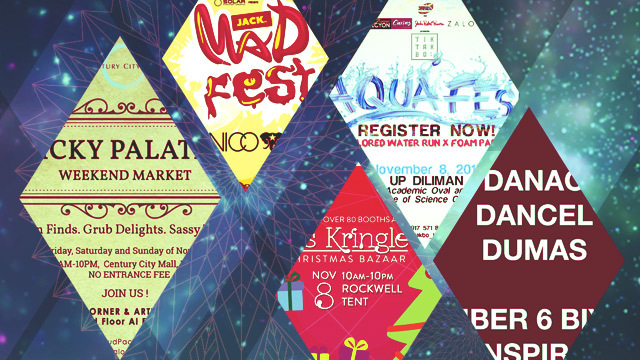 WHEN: November 7, 3 p.m.
WAZZUP: We don't know about you, but we definitely wouldn't want to miss the biggest music, arts, and dance festival in the country. Oh, the headliner is "Am I Wrong?" duo, Nico & Vinz! Need proof of our unbridled excitement for this one? Click here! WHEN: November 8, 10 a.m. to 10 p.m.
WAZZUP: An advanced Christmas shopping spree won't hurt, especially with over 80 booths of gift ideas to choose from! Get in for only P20! ...with Johnoy Danao, Ebe Dancel, and Bullet Dumas! WAZZUP: Need a place to chill out after a freaky Friday workday? Let Danao, Dancel, and Dumas soothe your stressed out senses! See you! WHEN: Every Friday, Saturday, and Sunday of November 2015, 10 a.m. to 10 p.m.
WAZZUP: Our weekend guide wouldn't be complete without an all-out food fest! Satisfy your raging palates with scrumptious grubs and sweet eats! WAZZUP: Warm yourself up for the next workweek by revving up your system in this colorful run for a cause! Bro tip: Bring extra clothes!